Long Story Short: The death of their high school coach brings 5 friends back together. But life isn’t as careless as it used to be in seventh grade. Whether it is unemployment, an oedipus complex, spoiled children or an ungrateful mother-in law, each of them has issues, that will be revealed when they decide to spend the 4th-of July weekend together. Review: Adam Sandler used to be on the top once, but somehow his movies became very stereotypical and senseless. That’s my Boy and Jack and Jill have probably been his worst movies by far. 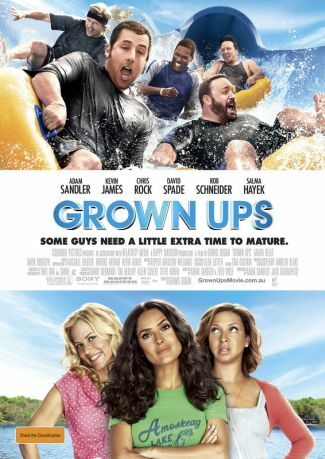 If I compare Grown Ups to these two I would definitely say it is a solid comedy about… well, growing up. But if I look at it as an individual movie I see a bunch of great actors trying to save a relatively thin script that lacks not only in ideas but also creativity. Knowing that it is not the tightest or most creative storyline I think it can still be entertaining and if you like the actors I am sure you won’t be completely turned off by this movie. Personally I don’t understand why they made a second part, but I guess that’s Hollywood.